By a / February 25, 2009 / . By way of introduction, curator Astria Suparak has given us an astute critique of the proliferation of big-box structures, an immersion in the artist collaborative Yes Men as they challenge a capitalistic system on steroids, and, currently, an overview of the visual expression risen from international movements that pursue social examination and change. 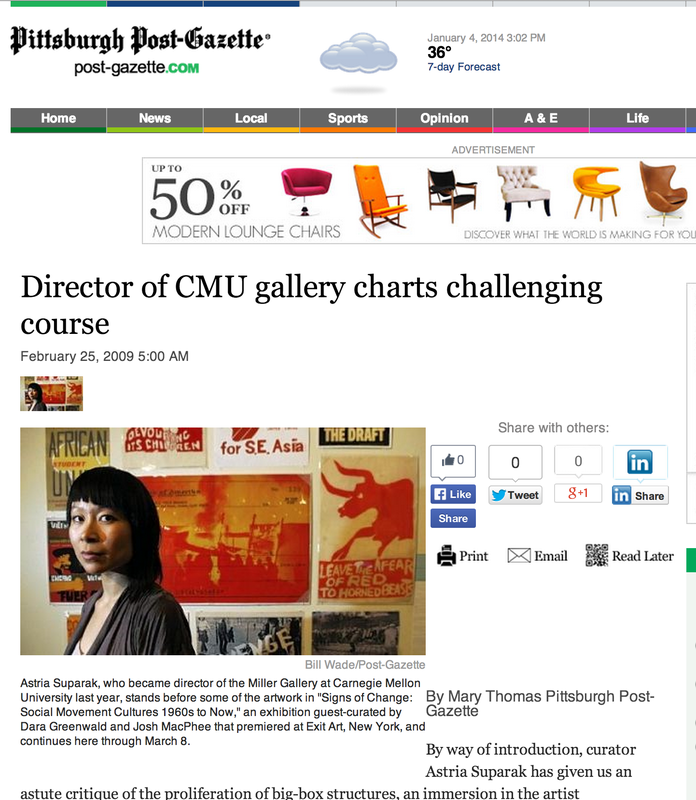 Not bad for the first exhibition season planned by the new director of the Miller Gallery at Carnegie Mellon University. It’s a portent of things to come and also a window into the persona of this fresh and savvy Los Angeles native. She arrived in Pittsburgh from Syracuse, N.Y., where she was the founding director of Syracuse University’s Warehouse Gallery. Considering that exhibition schedules are set months, if not years, ahead of run dates, Suparak’s fall lineup appears particularly prescient. Her subjects converged with national concerns and news, as well as with individual unannounced initiatives such as the Yes Men’s sensational “special edition of The New York Times,” which hit Manhattan streets while their exhibition was up here. But it’s also a reflection of someone tuned in to her times. “Curating is a practice that can be challenging, illuminating, influential, educational and subversive,” Suparak says with a twinkle in her eyes. The on-target contemporary vision displayed by city newbies like Suparak and Warhol curator Eric Shiner, coupled with the solid reputations of our more traditional institutions, bodes well for Pittsburgh’s growth and success, serving residents and adding to the region’s attractiveness to new investors.